If your web application is built on Ruby on Rails, you are in luck, as Patrick McKenzie has created ABingo, an excellent A/B testing framework plugin. 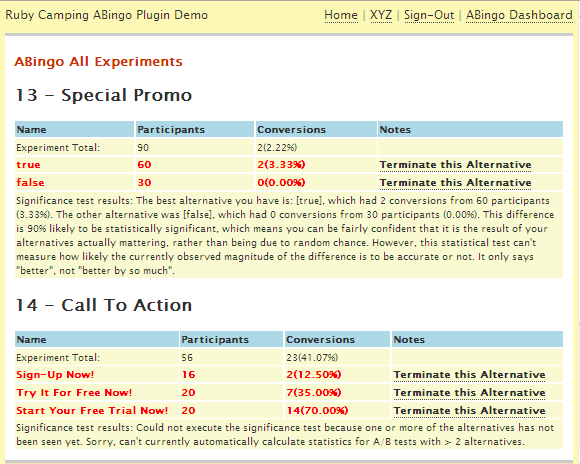 ABingo even includes a dashboard to view the test participations and conversions. Since I am a big fan of the lightweight Ruby Camping Micro-Framework, what I needed was an ABingo Camping plugin. Since none existed I emailed Patrick McKenzie to get his blessing and started to adapt his plugin! To illustrate the usage of ABingo, we’ll use a simple tester representing a fictitious SAAS Application. From the home page we’ll be able to access the landing and corresponding sign-up pages that we want to experiment with. We’ll also provide sign-in/sign-out options and a link to the ABingo dashboard if the signed in user is the administrator. To increase our sign-ups we will be experimenting first with different calls to action in our sign-up button. Our experiment named call_to_action will randomly vary the text of the button. We track the selected option and track the conversion on our sign-up page. After running our experiment for a while we will be able to see on the dashboard which option generated the most conversion! It’s that easy! And as a side note an experiment alternative can be a simple boolean, an array of arbitrary values, or even a hash of options. You can try the demo app yourself at: http://camping-abingo.heroku.com/. 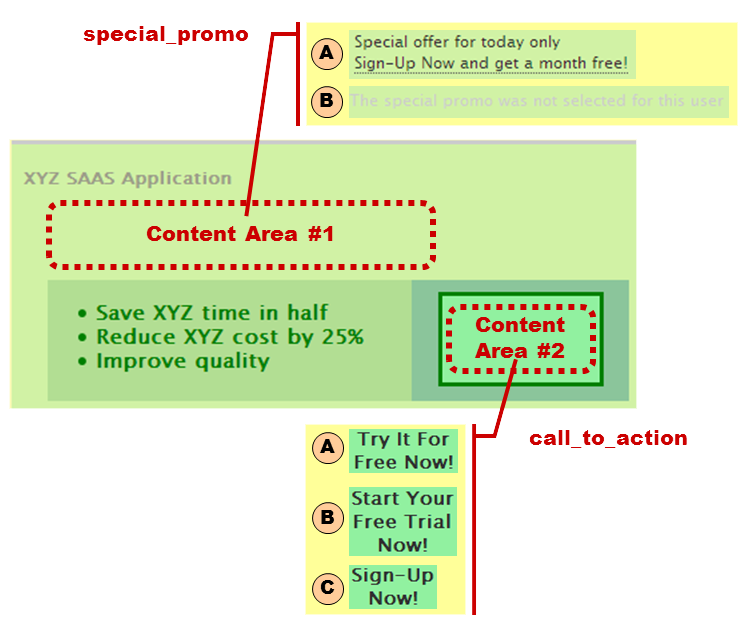 A/B testing is a key practice to improve usability as well as user conversion on a web application. 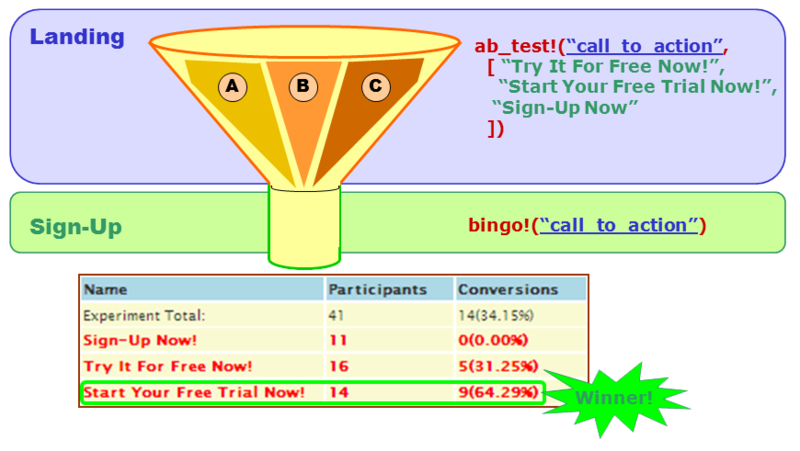 This introduction to ABingo should have given you a feel for how easy it is to add A/B testing capabilities to a Ruby Camping web application using the ABingo Camping plugin. In a subsequent post I will cover the specific implementation steps to add ABingo to our test application. Stay tuned!